Sunderland Indie rock quintet Cohesion release their second EP Pleasures of the Earth today and head to the region as part of their UK tour on Saturday. 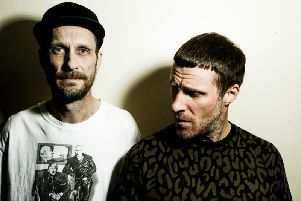 Dubbed as ‘one of the finest bands to come out of Wearside in recent years’, the band have previously shared stages with the likes of The Cribs, British Sea Power and Dizzee Rascal. Guitarist Lewis Cooke said: “Over the past year and a half both personally and as a band we've had to work through some tough times to get back to a point where we feel creative and inspired. The first single from the EP, Eagle, This Is Columbia, is available now via download and streaming services and an accompanying video is currently on video streaming platforms such as YouTube. The EP was recorded and produced by long-term friend Anthony Edward Snowdon. Frontman Matthew Watchman added: “Creatively this EP is so exciting, it’s been nice to get back in the studio, writing again as a band and just enjoying music. Pleasures of Earth is available today on iTunes, Bandcamp and Spotify. Cohesion headline Firebug in Leicester on March 25.